and intelligence "On the firing range during the third week of Advanced Individual Training, I put down the handgun I had been assigned and stood back from the shooting podium. The sergeant barked something barely intelligible about six years in Leavenworth Federal Prison for refusing a direct order. Unfortunately, due to sales rights restrictions, we cannot offer Medic! for sale in your country. "On the firing range during the third week of Advanced Individual Training, I put down the handgun I had been assigned and stood back from the shooting podium. The sergeant barked something barely intelligible about six years in Leavenworth Federal Prison for refusing a direct order. I repeated that I wasn't going to train myself to kill anybody. Like falling dominoes, every soldier on the range stopped to turn and look at me. The sergeant called me a coward. I said again that I wasn't going to shoot the pistol..."
In August 1968, Ben Sherman – then an eighteen year old college sophomore – was drafted, yet another Midwestern boy called to serve his country in the rice paddies of Vietnam. After his attempt at conscientious objector status was refused by the draft board, Sherman distinguished himself almost immediately upon entering the military: he refused to fire a weapon. Instead, he told his superior officers that he was willing to serve in any capacity that would not require him to carry a gun. Within a few short weeks he found himself in swamps of Vietnam, working as a combat medic. From his start in the morgue, cleaning the bodies of fallen soldiers before they were sent home for burial, to operating on dying men while under front line fire, Sherman's story captures the sounds, smells, and terror of Vietnam as experienced by so many American soldiers who ended up in Vietnam without wanting to be there. 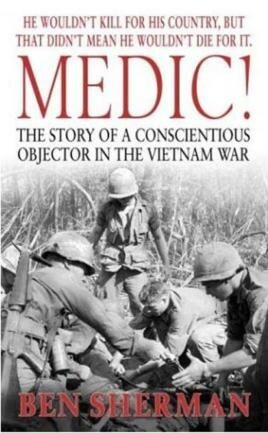 Written with a rare combination of humour, honesty, and intelligence, Medic! offers a glimpse into a world where unrelenting pressure and unbearable circumstances were commonplace, where heroes fell on the battlefield daily, and where one man struggled to keep his conscience clear in the face of unspeakable horror.